Exactly 8 years back, around this same time, I sat in front of the computer writing a list of names. I asked friends and I too came up with a few names and the list was getting really got long! I was almost due with my first child but I was not choosing a name for the kid! Around here, we select the name only after the baby is born. If you are wondering about that lengthy name list, I will tell you what it is all about. I was in the process of starting a blog!! There were a couple of friends who were asking me for some easy to prepare dishes and I wanted them documented in some place so that it can be referred when ever needed. A blog seemed a good idea! So the name list was for the blog and after mixing and matching the names from this list, I settled on Seduce Your Tastebuds! I wanted to post just one recipe per week and that’s how things went for a while. When I received the first comment on the blog for one of the recipes, I was ecstatic! It was like I received some great prize for my work! I could not believe that my blog was read and people had time to write a comment for my post!! Then slowly I started increasing the number of posts. Mom would warn me not to spend too much time on the computer as it would stress me out which would add to the strain of taking care of an infant! Once the routine settled, the number of posts grew and so did Lil Angel. When ever I recollect the times that Lil Angel would try to peel me away from writing the blog post, I have a hearty laugh as I feel she was trying to get me away from the thing that took me away from playing with her! I could even sense a feeling of sibling rivalry between the kiddo and the computer!! Back in those days, I never really focused on setting up an elaborate set up to click pics as there would be Lil Angel standing beside me,eager to grab the bowl that I am clicking or I would be carrying her and clicking with the other hand!! Even now I wish I put up a better set up while clicking the pics but this is all I can manage for now! I know such nostalgic posts are better reserved for the blog’s anniversary post, but today when I was going through some of the oldest posts in the blog, I walked down the memory lane, reliving those wonderful times! But well, this is the 2016th post in the blog and maybe this is a good time to get nostalgic!!! This briyani came into being when Lil Angel came home from school one day and praised the lunch her friend had shared with her. She asked me to make the same lunch telling me that since I blog and try out new recipes, my version would be better than her friends lunch!! When the kiddo had such a confidence in me, it is only fair to try to make something that meets her expectations. So I got a pack of small meal maker / soya chunks and prepared it for her lunch box. Amidst the rush of getting the kids ready for school,I even clicked pics so that I could use it for the blog if the dish turned out good enough. So I packed it off in her lunch box and then around noon, clicked the final pic for the blog as well.I waited for her verdict with so much of anticipation like I was waiting for some examination result! Now since this post is on the blog, you would have guessed how this dish had turned out. She was so happy with the lunch and even shared it with her friend who introduced this dish to her .Lil Angel even complimented me saying that her friend liked my version better than her mothers!! 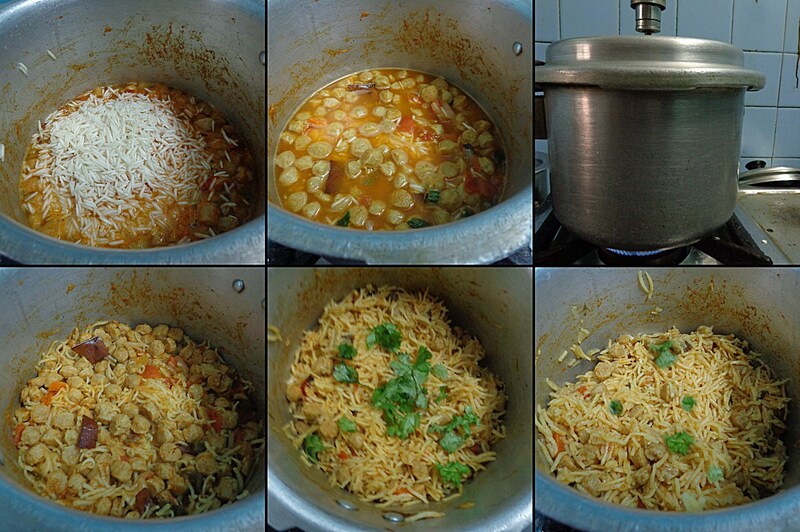 Since everyone at home liked this, I have been making this quite often especially when we have guests over for lunch. It is an easy one pot meal which needs very little supervision and no elaborate steps involved. Sometime I add chopped vegetables to make the meal more filling and nutritious. I interchange the masalas to give it a twist. But what ever way it is cooked, it is always a hit at the table. And before we go on to the recipe, I have a confession to make.After a really long, long time, I am writing a post this lengthy!!! Heat a pan with plenty of water and add the milk to it. Put in the soya chinks and when it comes to a boil, switch off the flame and cover the pan. Let it sit for 5 minutes. Drain the water and rinse the soya chinks in plenty of cold water. Squeeze out the water and transfer to a vessel and set aside. Wash and soak rice for 15 minutes. Drain and keep aside. Heat ghee in a pressure cooker and add the whole spices.Saute for a few seconds and add onions and saute till the onion is soft. Put in the tomatoes. 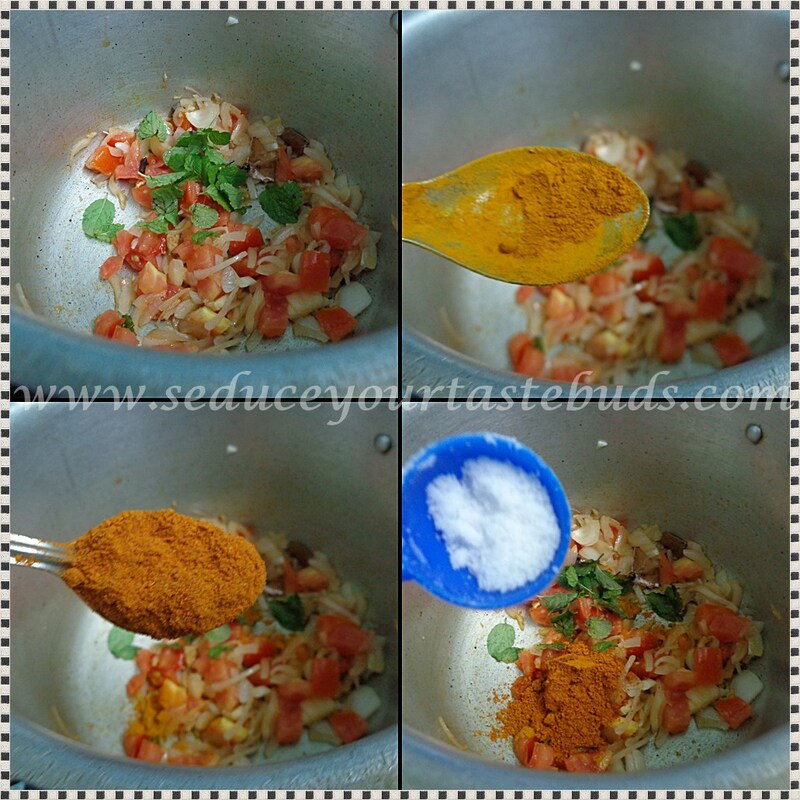 Add mint leaves, turmeric powder, red chili powder and salt. Cook till the tomatoes are mushy. Add the soya chunks and mix well. Add 2 cups of water [or the quantity of water that you use to cook your regular brand of basmati rice] and bring to boil. Put in the drained rice and mix. Cover and pressure cook for 4 whistles/ 10-15 minutes/ till the rice is cooked. It should not turn mushy though. Once the pressure releases, open the pressure cooker and give it a gently mix. 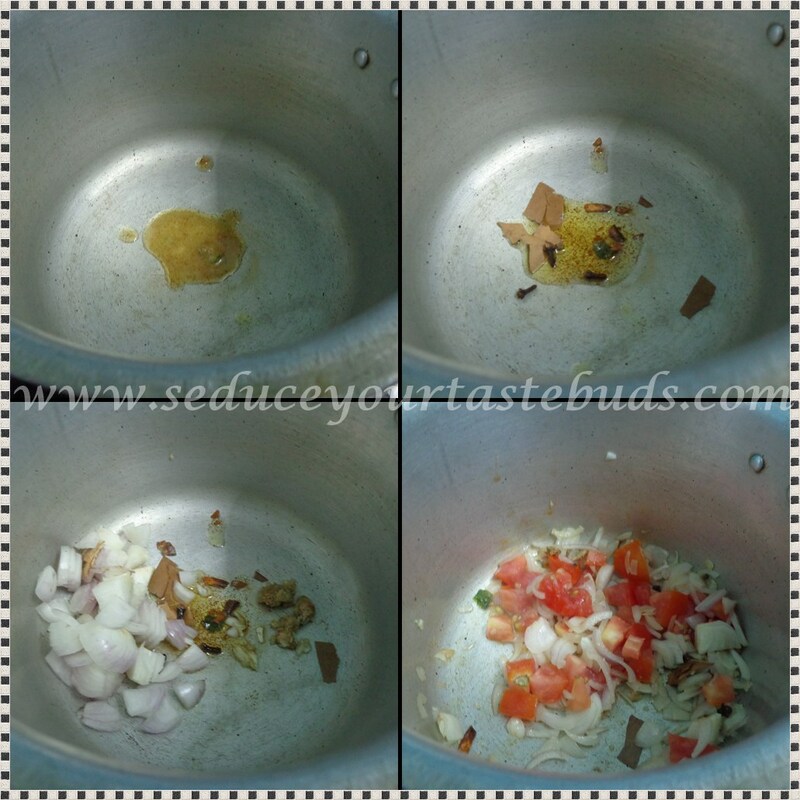 Add coriander leaves and mix a little before sercing. Serve with some crisps and raita..
You can add sambar powder / pav bhaji masala instead of red chili powder. 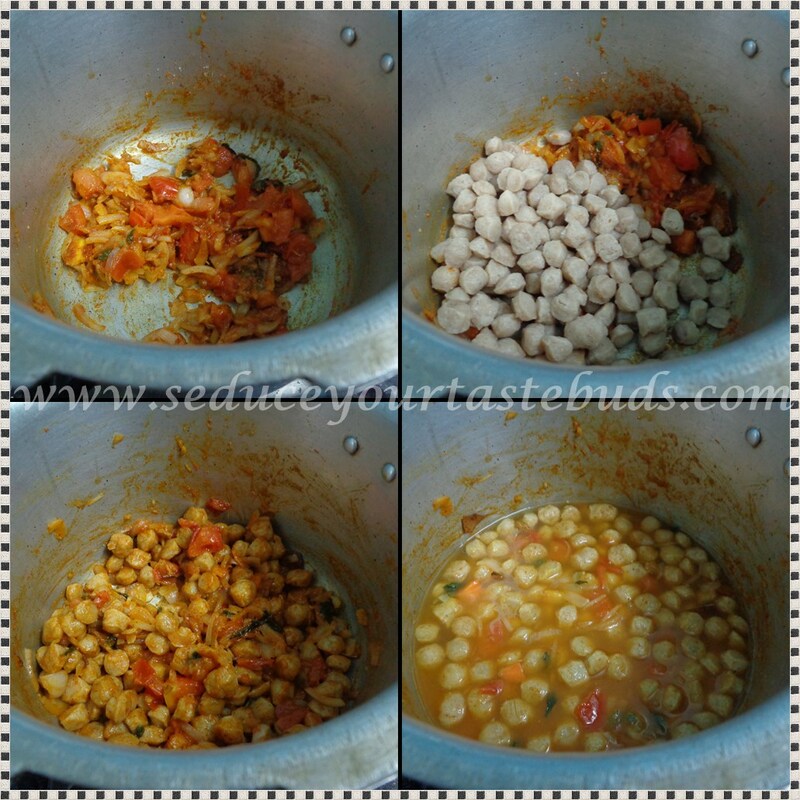 Chopped veggies like carrot, beans, peas, cauliflower and potato can also be added. 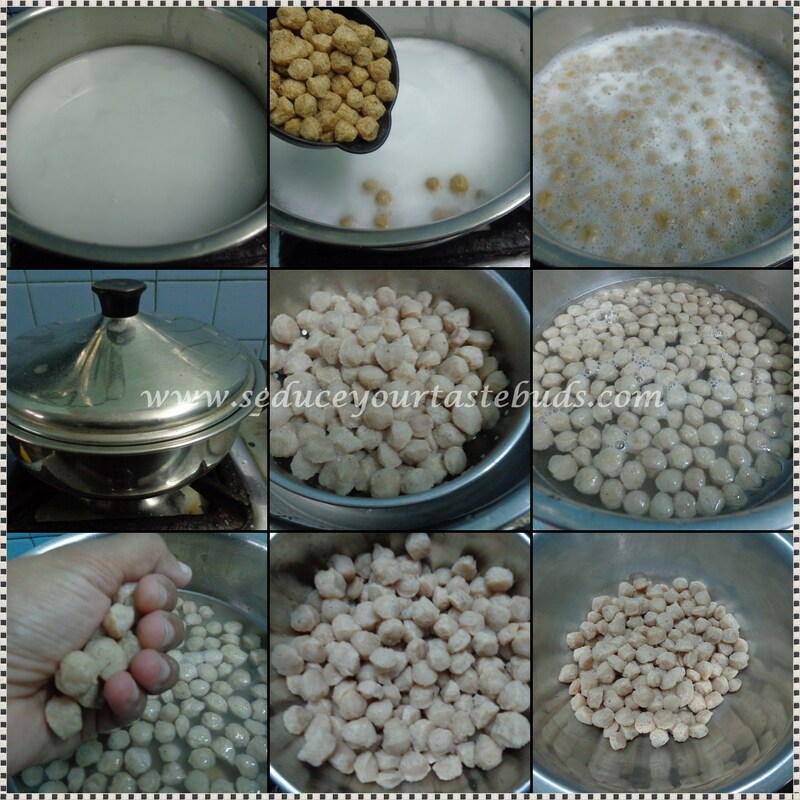 The larger variety of soya chunks can also be used. Sunflower oil can be used instead of ghee. Regular rice can be used instead of Basmati rice. Cant ask more, my favourite briyani anytime. Just love this biriyani with some papads. PJ I still remember the time we first interacted and how you said you can't post from china and you asked your Dad to do it for you!..wow so many years have passed by right…your blog is a treasure trove and I have always enjoyed reading your long intros…This soya chunk biryani sounds amazing..and my kids also love it! simple yet delicious soya chuncks biryani. I love these one pot meals. Love your posts PJ and I always look forward to reading them. Soy chunk biryani looks delicious. Soya chunk biryani looks very inviting. Biryani looks colorful and flavorful. I was not a big fan of soya before but now mini soya chunks and soya granules are often my protein on meatless days.